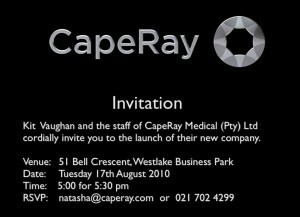 After a decade of research at the MRC/UCT Medical Imaging Research Unit, CapeRay Medical (Pty) Ltd was officially launched at the companyʼs new offices at the Westlake Business Park. Over 70 guests joined the CEO Dr Kit Vaughan and his staff for an opportunity to see the spiffy facilities and to hear about the companyʼs plans for the future. 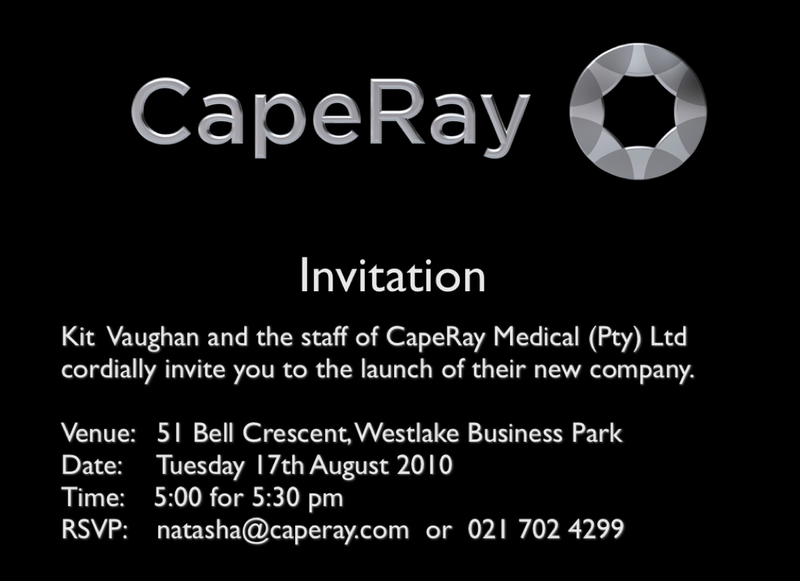 As Vaughan reported, “We have to position ourselves in the market as a serious competitive manufacturer of medical imaging technology”. He further explained that CapeRay was developing a world first, a dual-modality technology that will combine both X-ray and ultrasound images to produce the most detailed and sharpest images yet for detecting breast cancer. The guests were promised a follow-up party in about a yearʼs time when the PantoScanner system was to be launched as a commercial product. 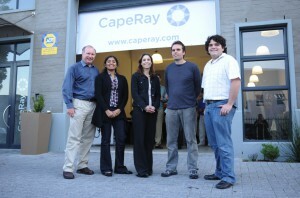 CEO Kit Vaughan, far left, with his team: software engineer Susan Alexander, business manager Natasha Steele, senior design engineer Michael Evans, and electronics engineer Benjamin Lunsky.